Was born on November 29, 1945. In 1962 he graduated from Kežmarku. Worked as a handyman in Tatrasmalte in Matejovce. In 1963-1967 he studied at the Pedagogical Faculty in Prešove, but did not finish his studies. Another year worked as a handyman in Poprad. In 1969, he joined the company Tatrasvit Svit, where he worked for 18 years. Since 1987, he is a free artist in free swimming. In 1965, he began to caricature, eventually turned into the leader of this genre in Slovakia. 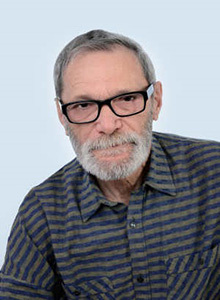 He was published in dozens of Slovak, Czech and foreign newspapers and magazines in Slovakia, especially in Mlada, a change for a week, and from 1969 in the legendary “Rogach”, where he worked until 1990. He won many prestigious awards in domestic and international contests of cartoons. He wrote epigrams. Since 2008, he exhibits his works on the Internet portal www.prop.sk. In 2013 was awarded with a special prize XIX International contest of cartoons on beer under the name Golden Keg. Artist of the magazine “Rogach”.